The PC 50, as the race is known, proved to be the most popular event yet on the USCS calendar, selling out all 300 spots prior to the race start. Race day conditions couldnt have been better as riders rolled off the line at 7AM to warm temps, clear skies, and perfectly tacky dirt. 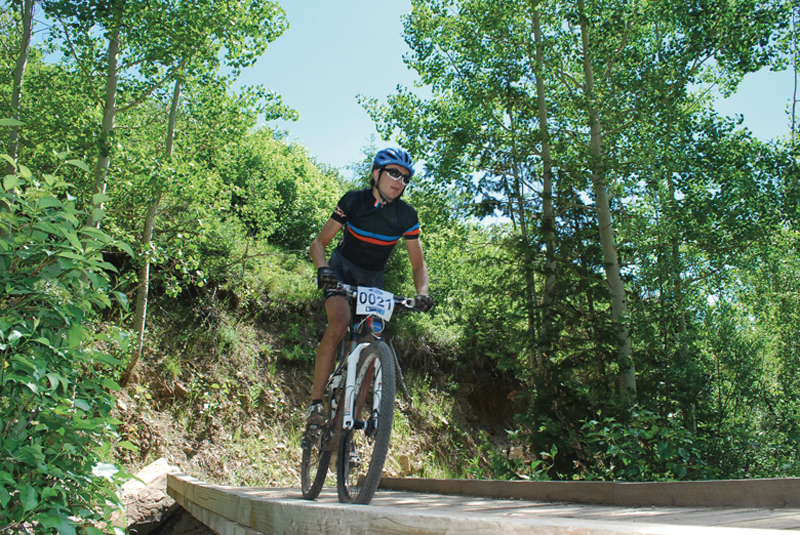 After a short neutral start riders were set loose on a steep fire road climb leading to their first taste of the renowned Park City singletrack. An early lead group including local rider Nate Miller (Dollys), Cary Smith (Hammer Nutrition), Coloradoan Brad Bingham (Moots), and newly crowned U-23 national road champion Rob Squire (Bingham Cyclery) surged off the front. The leaders stayed together until feed zone 1 when Squire and Smith pulled away on the steep Daly Canyon climb. Once up front Rob Squire showed why hes a national champion, crushing the climbs and tearing through the one track, the Binghams rider opened up some breathing room on the competition. Meanwhile Smith rode his own pace never falling more than a minute behind the much younger leader. Behind the two leaders things were starting to shake up. The top-10 positions changed constantly between a large chase group including Utahs best mountain bike racers including Roosters teammates Jonny Hintze, Quin Bingham, Brent Pontius, and Jake Pantone. Nate Miller was dropping back as riders like Casey Zaugg and Tyson Apostol were surging through the group with Apostol doing damage on the road climbs. Experienced endurance racer Chris Holley (Trek 29er) looked to be having an off day sitting outside the top-10 at the halfway point. At the second feed, roughly 30 miles into the race, Squire held a comfortable lead of just over a minute on Smith. Soon after leaving the feed, disaster struck as Squire crushed his right pedal on a rock. Still able to pedal, he continued on but Squire couldnt actually clip his foot in making the rocky, technical descents in the last 15 miles of racing even more difficult. After entering the Iron Mountain section of the PC 50 Squire was doing everything he could to stay connected with his bike. “The climbs were OK but in the rocky descents, especially on that section of Mid-Mountain (Iron Mountain) my foot was just flying off the pedal, Squire said after the race. With the leader struggling, Cary Smith quickly closed the gap and grabbed the front of the race. Once out front, Smith turned the heat on, powering his way through the final sections of the course and across the finish line over two minutes up. Smith took home the win and a check for over $900. Squire held on for second place battered with a crushed pedal and shredded shorts after snagging them just feet from the finish. Third place went to Chris Holley who turned in a near-miraculous ride. Holley resurrected his ride after feed zone two and turned in perhaps the most impressive late race surge ever witnessed. Holley refused to give up after struggling in the mid-portion of the race. The Trek 29er rider stayed on the gas and ultimately moved from outside the top-10 to third in less than 20 miles. Jonny Hintze took fourth leading another impressive ride from the Roosters team as the final podium spot was decided in a sprint between teammates Bingham and Pantone with Bingham crossing in fifth. In the womens race, National Ultra Endurance leader Amanda Carey (Kenda/Felt) entered as the overwhelming favorite. Carey has been all but unbeatable this season especially in longer endurance races. At the start, Carey didnt disappoint. She took the lead early and excelled on the road climbs using her power to lengthen her gap on second place. While the race leader was no surprise, her closest competitor certainly was. Evelyn Dong, who recently relocated to Park City, was a revelation in the PC 50. 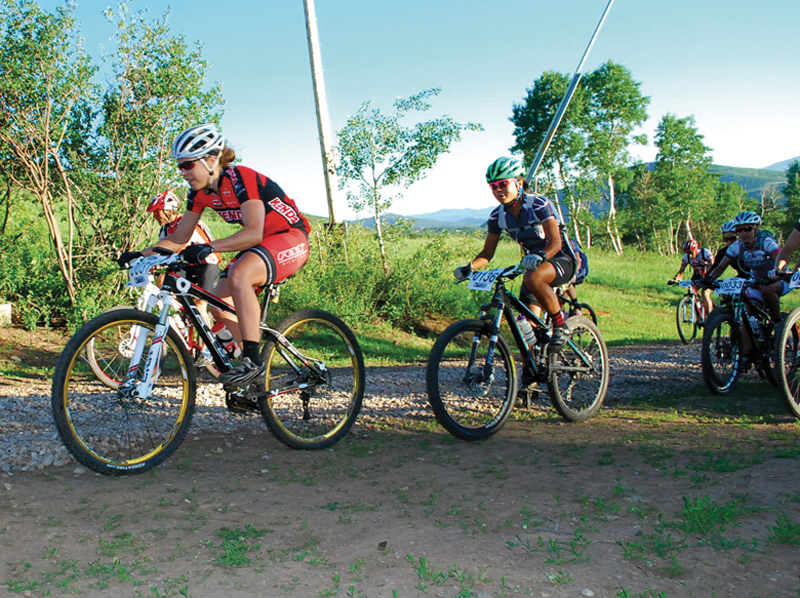 An experienced cross country ski racer, Dong showed she has remarkable skills on the mountain bike as well. Her fitness obviously carried over but the PC 50 course is full of tight, twisting, and technical singletrack that requires the best in handling skills and the relative newcomer proved to be up to the task. Despite the impressive challenger, Amanda Carey proved once again to be unstoppable. Carey never appeared to be under pressure and rode a confident and calculated race from start to finish. Carey took the win with a time of 5.01.17 and the first place check for $849. Evelyn Dong crossed the line just over 3 minutes back to take second. Third place went to Trek 29er rider KC Holley who, like her husband, turned in a strong performance in the second half of the race to take third place. KC chased down and passed accomplished XTERRA racer Emma Garrard (Specialized) just miles before the finish. Garrard took fourth ahead of an elated Jenelle Kremer (Revolution/Peak Fasteners) who took fifth. In the week prior to the PC 50, race officials had been battling with local Park City residents moving the course markings. On race day, officials were again forced to compete against locals actively sabotaging the course while the race was in progress. While riders were forced off course in one short section, race officials located and fixed at least four other critical areas of tampering just before the riders arrived. Due to their quick work racing was not significantly impacted.